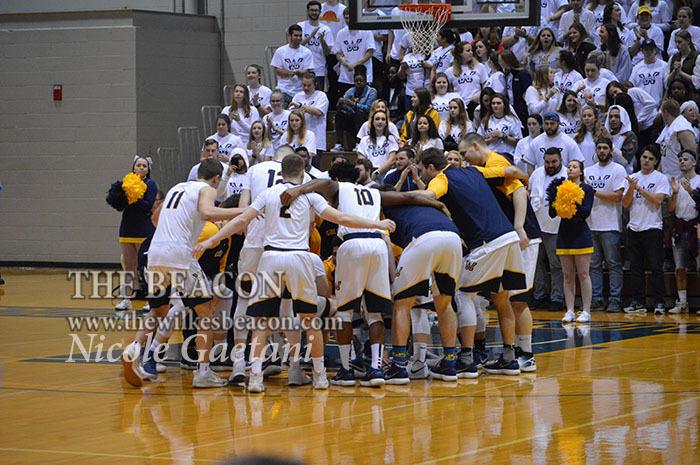 WILKES-BARRE, Pa — Rivalries bring out the best and worst in teams, and the latest installment of the King’s vs Wilkes men’s basketball rivalry proved just that. The difference this time around was all of the good tilted towards the Monarchs. They dominated the Colonels behind Noah Tanner’s big night to pull off the upset 81-53 on the men’s side, and pulled away late to grab another win in the women’s game 73-59. King’s came out early in the men’s game and made a statement when freshman JJ Glinsky made a three to open the game. The Monarchs took control from there and quickly found themselves up by double-digits within minutes as the Colonels couldn’t get their shot to fall. Andrew Hudak and Tanner both led the Monarchs with nine points in the first half, but also were a plus 21 and 22, the highest for any other players. Tanner went into the half with six assists and three rebounds. King’s rolled on holding a 19-point lead, 45-26, at the break. The onslaught continued into the second half as the Monarchs went up by as many as 25 to start the half. Tanner and the Monarchs continued to play motivated by the rivalry. Tanner continued to build on his big night as the Colonels struggled to find an answer for him. Wilkes looked like they had finally settled in with 10 minutes left in the game, as they cut into the deficit. They continued to fight, but couldn’t cut the Monarch’s lead any lower than 18. Tanner finished the game an assist shy of a triple-double with 16 points, 10 rebounds and nine assists. He also added five steals to his line. Rob Pecorelli and his 15 points led the Colonels. In the women’s game, King’s struck first in the game but Wilkes found an answer. That seemed to be the story of the half as King’s continued to take the lead, but Wilkes had an answer every time as they kept things close. After a nice run by Wilkes, King’s went into halftime leading 31-27. King’s had a majority of their points come from three players, Rebecca Prociak who had 14, Mackenzie Yori who had eight and Alexis Steeber has seven. Samantha Rajza also had two for the Monarchs. Wilkes spread the first half scoring around as Kayla Aufiero and Gab Giordano led the team with five points each, Ashley Caster had four and Stef Kramer, Gianna Roberts, Vanessa Whitecavage and Gabby Smicherko each had three points. The third quarter was more of the same as Wilkes scored five unanswered to take their first lead of the game. Things continued to tip back-and-forth but Kings, led by Prociak, went on a run at the end of the quarter to take a 53-43 lead. Alyssa Alfano started the fourth quarter hot, scoring the Colonels first five points, but King’s came right back to reclaim their 10 point lead. The game remained close, as Wilkes refused to go away. The Colonels fought and found themselves down by seven with 4:26 left in the game. King’s continued to fight as well though as they answered with a run of their own to pull away. The Monarchs ended up closing the game out with a 14-point lead. Prociak finished with a game high 30 points and Steeber and Yori both finished with 15. The Colonels did not have a single player in double-digits but they did have eight players score between five and nine points. Caster led the stat sheet for the Colonels with nine points.